Private family estate with spectacular ocean views from every room. Located near the small, working harbor village (buy your lobsters right off the docks) of Cutler, Maine. Our property encompasses a large tract of land adjoining conservation ground for hiking and stargazing, silence and solitude. Back a private mile and half drive through fragrant spruce, firs and mosses walk right out onto a large, privately-owned stretch of bold coastline. This exceptional property hosts a heath (bog), pitcher-plants, grouse, bobcat and eagles. Whales and seals are regularly observed from the deck of the house. Moose are often spotted in the driveway. Watch the lobstermen pull their traps in front of the house. Soak up incredible sunrises and sunsets, misty fogs and sparkling seas. Storm spray can hit the windows of the house during a good Nor'easter..
- Approx. an hour and a half to Acadia Nat'l Park, forty minutes to Quoddy Head State Park, Lubec, Campobello Island and Roosevelt's summer home. Minutes to local restaurants, shops, University of Maine campus and bookstore. Spectacular hiking at Western Head and Bold Coast Trails out of Cutler. This large home includes four finished levels. Bedroom one includes one king poster bed and spectacular views of sea and sky. Bedroom two includes two queen beds, en-suite bath with soaking tub, open shower, private balcony and views of treetops, sunrise and dramatic coastline. 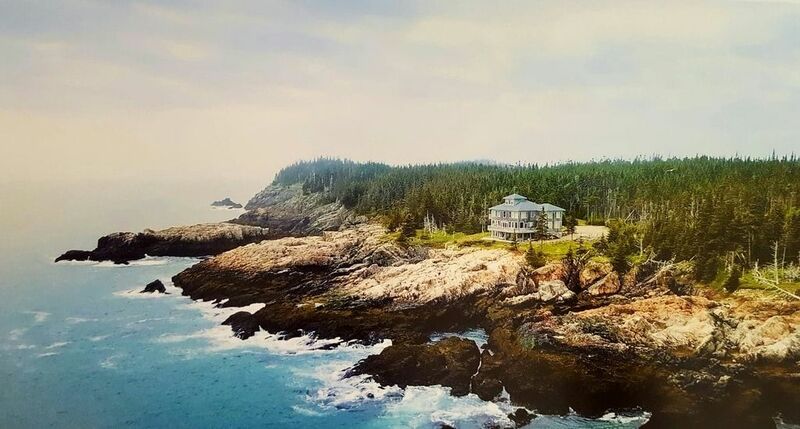 Bedroom three includes one queen bed, one daybed with trundle, walk-in cedar closet, spectacular coastline and sunset views and, access to second story balcony. Bedrooms one and three share full bath with open Italian tile shower and a soaking tub with picture window overlooking the open sea. There is a walk-out, oceanfront lower level with two queen size, fold-out sofas, extra refrigerator and large deck. Tastefully furnished throughout. Well equipped kitchen with custom cherry cabinets, tile floors, breakfast bar with seating, stainless appliances, gas range, open to dining area with large granite dining table and spectacular sunset and ocean views. Great-room well stocked with books, music, puzzles, videos/DVD's, maps, and nature guides. Ceiling fans and stunning views in every room. From the fourth floor OBSERVATION TOWER, watch the stars cross the sky and whales,lighthouse and ships in the distance.Open all the windows and fall asleep to the sounds of waves and foghorns (one twin bed). Kayak/canoe rentals, whale-watching, puffin/arctic tern, and seal spotting trips available nearby. The siting of this house makes it inappropriate for very small children. We had never before seen stars like you will see from the deck of the house. It looks like you can reach up and touch the milky way. In the late fall, the northerrn lights are mesmerizing. The smell of the sea and pines soothe the soul and the quiet and respectful pace of life in this part of the country reminds us of the amazing beauty and kindness that it is still possible to find in very special places. View of the sea from every room. Right on the open Atlantic ocean. Linens, extra blankets and down comforters provided. All towels provided. (2) Additional full size refrigerator in walk out lower level. Well equipped with excellent quality pots and pans, lobster pots, mixer, blender, George Foreman, coffee maker, toaster, etc. Wrap around deck overlooking the open ocean. Second living room on first floor can be used for bedroom. Has attached private, full bath with step in shower. This was our fourth visit to this wonderful location. We love it! If you are looking for a place to completely get away from everyone, this is it. This was the first time we never left the property the entire week, (except to pick up lobster) and the week went by faster than any other. Days filled with walking and climbing rocks. Evenings having a campfire while listening to the ocean. We were lucky to have a meteor shower while we were there too. So beautiful at night! It is impossible to express how unique this property is and it has become a favorite vacation destination for my entire family. We can’t wait to return! Thanks Carroll and Maureen! Thank you so much! It gives us great pleasure to know your lovely family had a good visit! We hope you can return for many years to come! I can not even begin to tell you how much my family and I enjoyed your home. A month before our vacation my husband was told his leukemia was no longer in remission and he would need to begin treatment again. The vacation could not have come at a better time and I can not envision a better place to relax and enjoy our children and grandchildren. Your home - so welcoming and peaceful with the unbelievable views of the ocean was just what we needed. Since my husband was diagnosed in 2013 we have rented a house each summer for the kids and grandchildren to come and spend quality time- this by far has been our favorite. No one wanted to leave when the week was over. I thank you for sharing your home with my family, I hope one day to rent the home again. Thank you again for choosing Somerled for your stay and for taking the time to share your experience! We are so glad you and your family enjoyed your time together! We send you and your husband all our best for health and healing and would love to have you again any time. All our very best to you. The Best Maine Experience Ever! Dear Carroll and Maureen -- it doesn't seem possible that exactly one week ago today we driving away from Somerled for the last time. I want you know that my family had a spectacluar time! Four generations of my family (Mom and Dad, my three sisters, 4 nieces and assorted husbands and great-nieces) will never forget our visit to Maine and your wonderful home. It was spacious and beautiful. I must confess that I was a bit nervous driving up that long gravel driveway, but once you get there -- oh my -- you never want to leave! We've rented many homes in Maine, other States and in Europe and I can honestly say that this was the best. Beautifully maintained, fully stocked beyond my wildest imagination and a million dollar setting. That view is incredible! I looked forward to getting up every morning and sitting out on the deck with a cup of coffee to watch the seals swim by and the lobsterr men pulling up their traps. We spent a day in Acadia, took a great whale watching cruise out of Lubec, drove over the Campobello and even found some time for relaxing. We dug for clams and made a huge pot of clam chowder. Picked wild blueberries. Made our own lobster rolls. It was the quintessential Maine experience. If you'll allow us, I feel certain that Jeff and I will be back. Perhaps next time with friends. Thank you again for making your home available to us. Please know that if anyone ever asks you for a reference, we'd be happy to extol the many virtues of Somerled. We recently had the pleasure of staying at Somerled for our second visit. We absolutely loved it the first time, and I was wondering if maybe we were going to be disappointed this time. To say that someplace is even better the second time around definitely describes this wonderful, unique home. Since we knew what the area has to offer ahead of time, this made our stay even more relaxing and enjoyable. Words cannot completely describe what you will experience here. If you are searching for someplace peaceful, quiet, and full of nature, this is your answer. The home is located where you will not hear any cars, and the only people you will see are the lobstermen as they pull and set their traps. Seals played in front of the house everyday we were there too! Complete relaxation! As I mentioned in my earlier review, the worst part is having to leave. The long trip we made from Indiana to Somerled is so well worthwhile. We hope to return again in the future, but hope to stay longer next time. The hosts of this home are absolutely wonderful! We WILL return! Thank you for sharing your amazing home! This is a beautiful property, both the house and the location! The pictures don't do it justice! The house is very clean and well maintained. The owner was very nice and helpful. I would highly recommend this property if you want to get away from the tourist areas, very picturesque and quiet. We had a wonderful time. A S.Where do you live? In response to the above review, the guest's deposit was justifiably retained due to damages and the condition of the house upon departure. They were properly notified, through multiple correspondences in writing, that the deposit would be retained and the reasons for doing so. During our 13 yrs. of family vacation rentals, we have greatly enjoyed our interactions with the families we have had the pleasure to get to know. We take great pride in our property and the level of professionalism and consideration shown to each and every guest. We will rely upon our record of excellent reviews from the many other families who have praised the property and location and let us know how much they enjoyed their stay, many of whom return year after year. This is a unique and very private property offering comfort and access to nature, spectacular, bold ocean frontage, extensive Trex decking (chosen for durability and aesthetics, several times the cost of traditional treated lumber - not plastic!) lovely forest trails, a beautiful heath (not a swamp), containing a variety of wildlife and rare plant life and immediate and exclusive access to some of the most beautiful hiking and scenery on the East coast. Our websites display many photos and text descriptions showing the nature and amenities of the property. We are always happy to answer any questions and do our utmost to ensure every guest has an enjoyable visit. Whale-watching, cycling, birdwatching, stargazing, spectacular hiking just outside your door. Casual dining, shops, lighthouses, historic attractions nearby. Check in time 3 pm. Check out time 10 am. Inquire for alternative arrangements.